I gave a talk yesterday at a conference on *Speed Thinking and it’s tool Ideas Blitz. Speed Thinking is an accelerated way of generating ideas and solving problems that can be used by individuals or small groups or teams. I developed this thinking system based on an insight. I found that if I could accelerate their thinking, managers would have no time to filter their ideas and real creativity would flourish. Over the past 5 years I have taught this system to literally thousands of people with great success. People are often amazed at what ideas emerge in 2 minutes or less. Speed Thinking is based on a 5 step process (i.e. start, enhance, connect, evaluate and action). It has been used by team leaders, students, managers, facilitators, coaches and teachers across many different countries and cultures. Speed Thinking and the tool Ideas Blitz is creative, fun and energising. I urge you to contact me and I can show you and your team how to Speed Think in a short workshop and it can be used immediately. 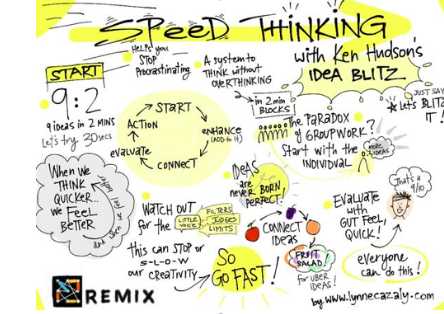 *The amazing image of Speed Thinking was sent to me by a participant in my workshop, Lynne Cazaly. Copyright, 2015 – Used with Permission.